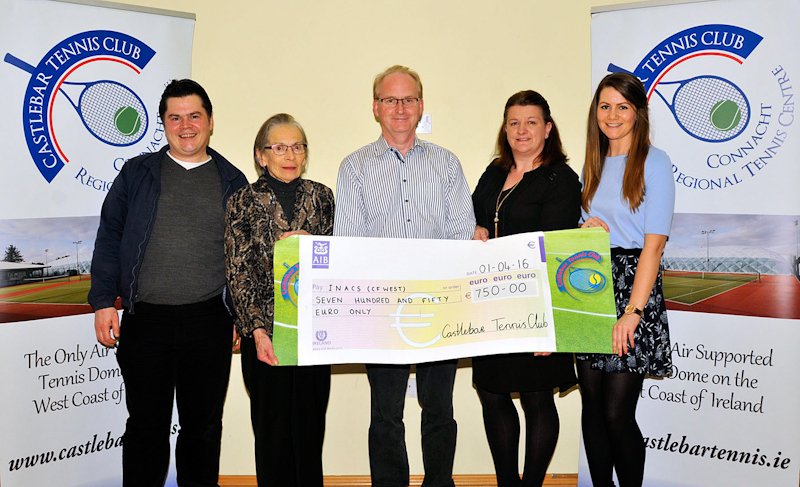 Presentation of a cheque for €750 from Castlebar Tennis Club, to INACS, cystic fibrosis west, the proceeds from the O’Kane Cup competition, l-r; Colman O’Kane, Irene O’Kane, Dr. Michael O’Neill, Mayo University Hospital Noreen McNamee Chairperson and Niamh Gavin Lady Captain. Photo ©Ken Wright Photography 2016. 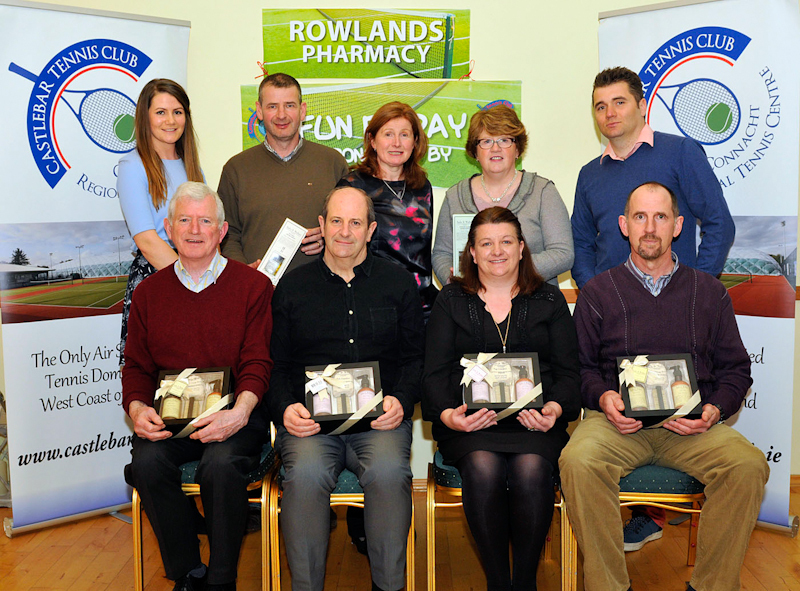 Castlebar Tennis Club Detox Friday competition sponsored by Rowlands Pharmacy main street Castlebar. Front L-R; Winners group A Paul Gavin, and Adrian Gavin, Winners group B Noreen McNamee, and Brendan Killion. 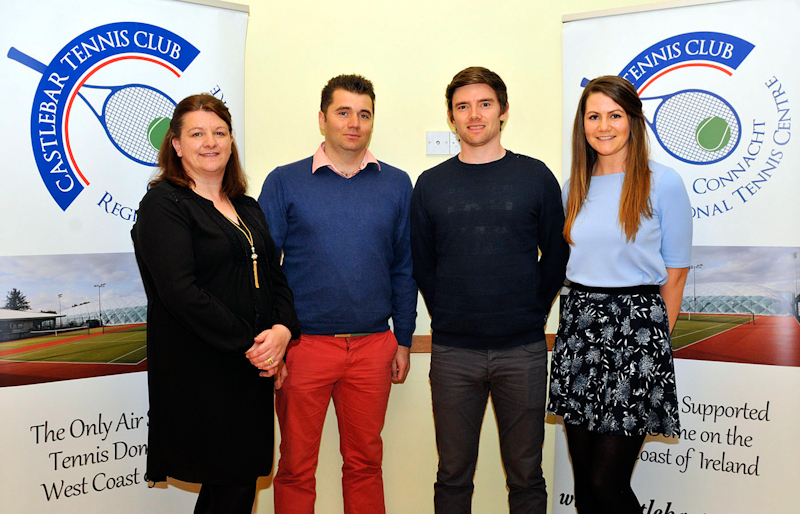 Back L-R; Niamh Gavin Lady Captain, Brian Healey Runner-up group B, Fiona Rowland Sponsor, Oonagh Bradley Runner-up group B, Daniel Irimia, men’s captain. Missing from the photo Diarmuid Gavin and Patricia Armstrong, runners-up group A. Photo © Ken Wright Photography 2016. 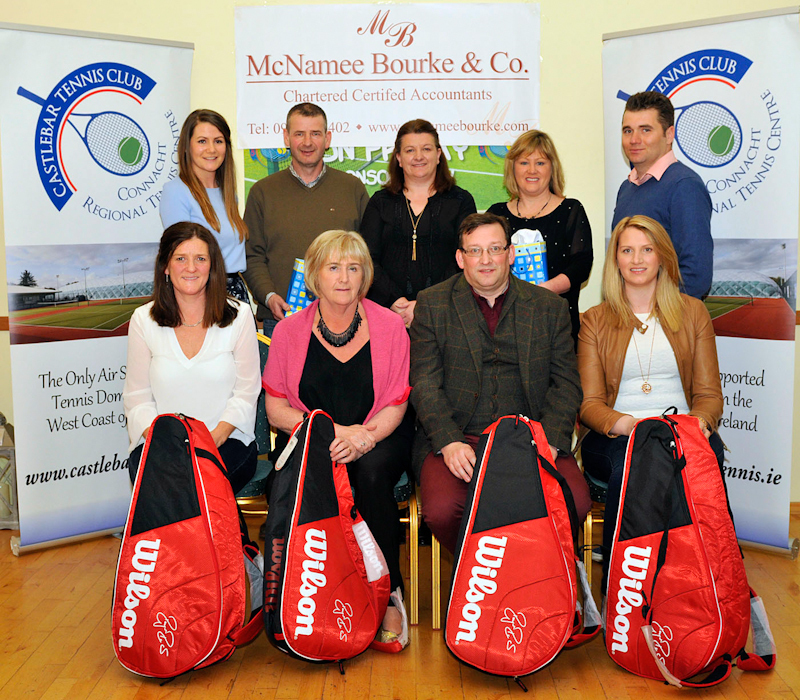 Castlebar Tennis Club winners & runners-up in the Manic Monday competition sponsored by McNamee Bourke & Co, front L-R; Winners Group A Ciara Jennings and Sinead Gavin, Declan Bourke, sponsor and Eimear McInerney winner group A. 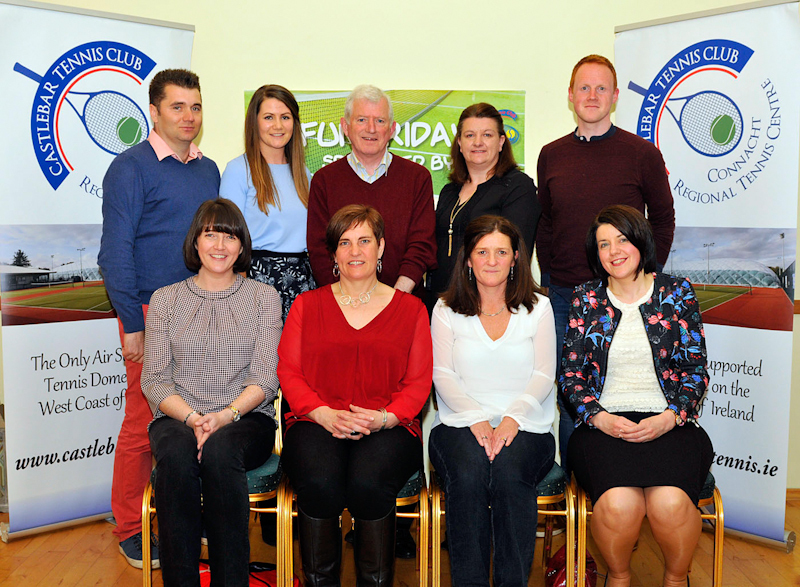 Back L-R; Niamh Gavin Lady Captain, Brian Healy, runner up group B, Noreen McNamee Chairperson, Katrina Conlon, runner up group B and Daniel Irimia, men’s captain. Missing from photo winner group B Ronan Glynn Photo © Ken Wright Photography 2016. Castlebar Tennis Club winners & runners-up in the ladies doubles ladder competition.Front L-R; Winners Grainne Cashin, and Thérèse Ruane, runners-up Ciara Jennings, and Emer O’Donnell. Runners-up mixed singles ladder.Back L-R Daniel Irimia, men’s captain, Niamh Gavin Lady Captain, Paul Gavin President, Noreen McNamee Chairperson, Eamonn Tiernan winner mixed singles ladder. Missing from photo Ciara Joyce runners-up ladies doubles. Photo ©Ken Wright Photography 2016. 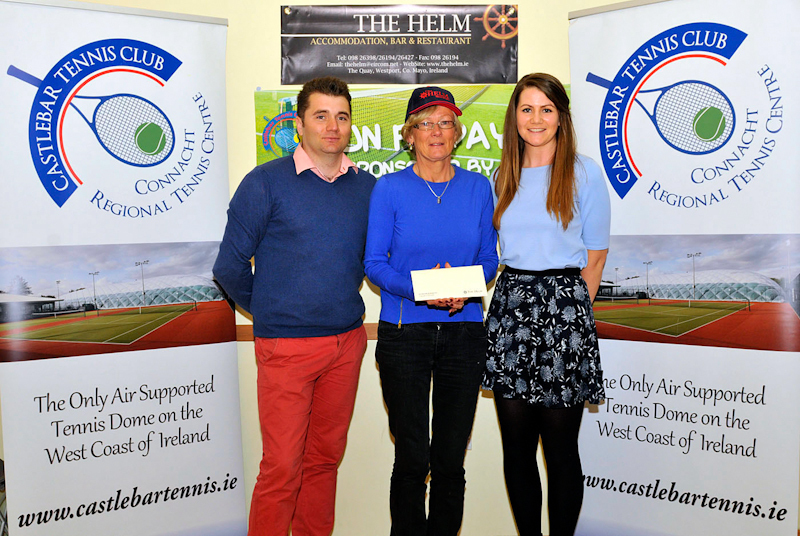 Pictured at Castlebar Tennis Club, Pauline O’Donohue spot prize winner in the Ladder competition which was sponsored by the Helm Bar and Restaurant Westport. 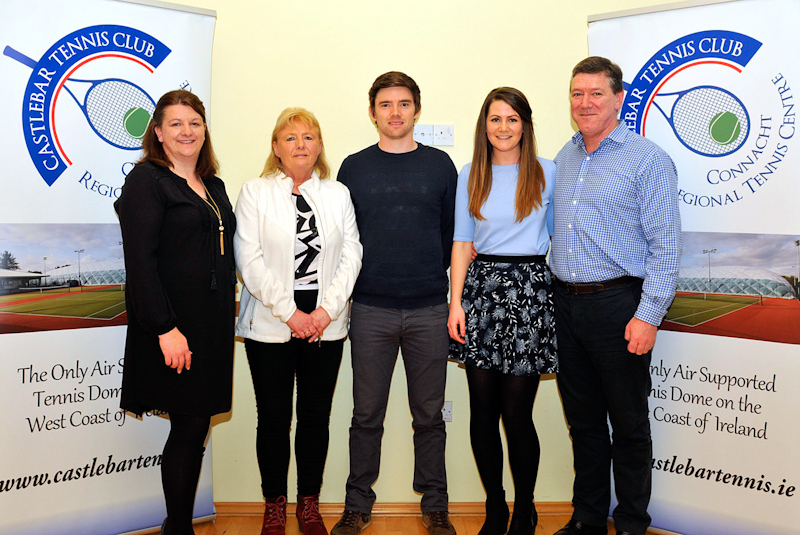 Also in the picture are Daniel Irimia, men’s captain, and Niamh Gavin Lady Captain Photo © Ken Wright Photography 2016.
International tennis player Daniel Glancy, who paid a visit to Castlebar Tennis Club where he started his career as a junior player pictured with Noreen McNamee Chairperson, Daniel Irimia, men’s captain and Niamh Gavin Lady Captain Photo ©Ken Wright Photography 2016. 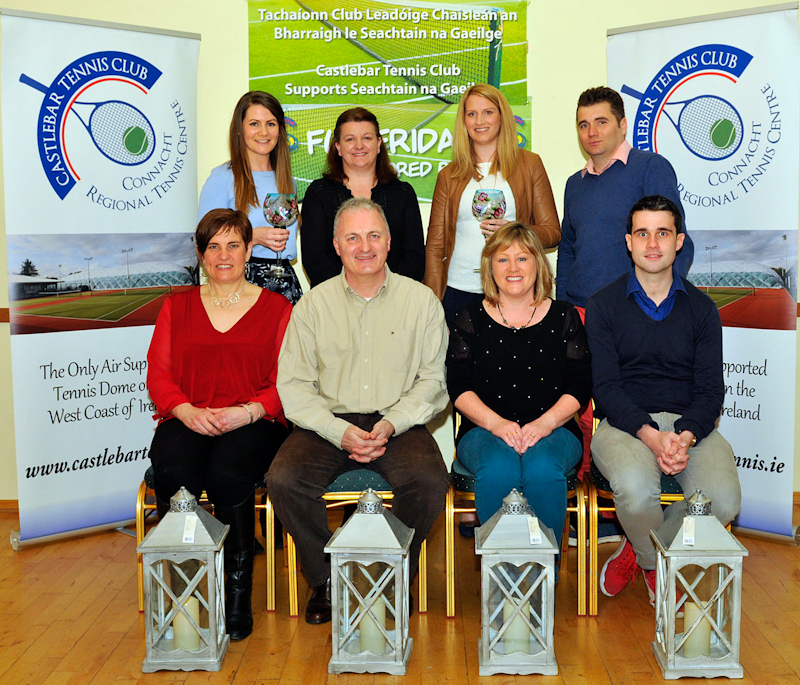 Castlebar Tennis Club winners & runners-up in the Oiche na Gaeilge competition sponsored by Conradh na Gaeilge, front L-R; winners group A Thérèse Ruane and Pat Conlon, Katrina Conlon and Paul Gannon winner group B. Back L-R; Niamh Gavin Lady Captain & runner up group A, Noreen McNamee Chairperson, Eimear McInerney, runner up group B and Daniel Irimia, men’s captain, Photo ©Ken Wright Photography 2016.